Born in Washington, D.C. in 1962, Ms. Duke spent much of her childhood painting alongside her mother, a talented watercolorist. She pursued her Master of Fine Arts degree at George Washington University under the tutelage of William Woodward and, after graduating, spent several years living and working in scenic Rappahannock County Virginia. In 1992, Ms. Duke moved to Northern New Mexico in order to paint the brilliant light and saturated colors of the high desert. While there she studied with the painter Wolf Kahn at the Santa Fe Institute of Art. Since returning to Virginia in 1994, Ms. Duke has continued to work as an artist and teaches art to young people at Wakefield School, in The Plains, Virginia. 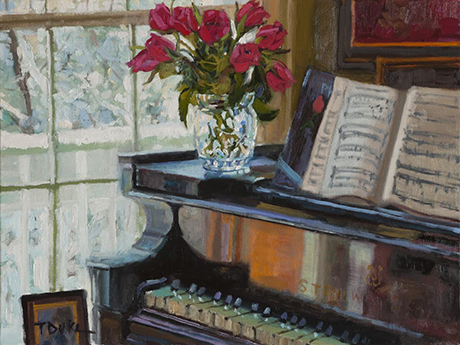 The rest of her painting time is balanced by studio work, where the pace is slower and the focus is on carefully composed still life paintings and portraits that are more personal and reflective in nature. Ms. Duke works in oils because of their lushness and responsiveness. Her approach to a painting is known as alla prima, a method developed by the mid-19th century impressionists that calls for a quick response to the subject. Painting alla prima is an immediate, but very calculated approach where the artist thinks about color, temperature and value while laying down abstract shapes calculated to gel into a composition that does credit to the subject.